So, where might this be? Photo will be attributed when puzzle is solved. We have a remarkable tide here, so it is at or near the sea. Is it near your place? Southern East England? It is not far from the sea, but neither near me nor in South East England, Ralf. I'm curious - what persuaded you immediately to go for England? As it was next to photos of animals painted in a cave...not England I would say. France or Spain? Ah Nari, clicking on my puzzle photos to get back to Photobucket won't help you. I only use Bucket for this thread, the row of cave paintings (all identical) is from my last puzzle pic. and the Bucket was playing up merry hell. I spent ages trying to persuade it to produce the one image I had uploaded and suddenly all my repeated attempts arrived together! Thank goodness I don't use it for my own photos. But I'm afraid you are wrong in your assumptions. Large tidal difference is again a clue. Flat, featureless and fertile landscape another. Temperate zone with four seasons from the type of vegetation, with some trees bare, others green. That excludes a large part of the world, but still leaves a large chunk to be considered. Not South East England she said, but that does NOT exclude all of the UK. The same suggestions like Ombugge did lead me to England. Landscape and shore remind me somehow to palces i have seen before. It is a winter picture and i wonder, if the picture is taken in the afternoon. That would allow to identify the direction, we are looking to. Although this might not hep in a river delta or river mouth. So i would stay in the U.K.. There are no French or Spanish attitudes visible for me, also the type of the ships is appearing North European to me. Is U.K. correct? UK is correct, Ombugge and Ralf. Loathe though I am to give clues at this early stage (I'm a mean so-and-so ) have another careful look at my reply to Nari. As to the time the picture was taken, I can't help as it's not my photo. 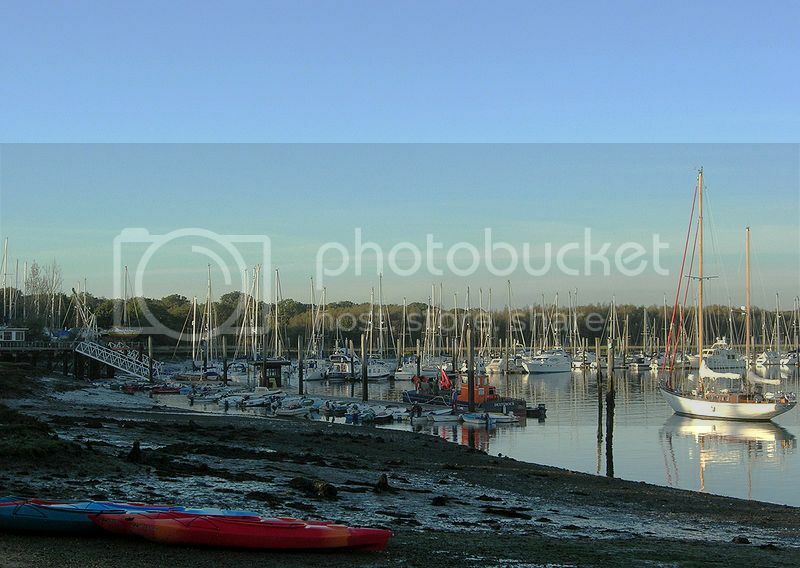 Mylor yacht marina, Falmouth, Cornwall, England? No, I'm afraid not, Ralf. Are we somewhere in the Bristol Bay area? Severn estuary perhaps?? Nowhere near the Bristol Bay area, Ombugge. I will be travelling during the next days, so no opportunity to check the numerous British marinas. So don't count on me before end of next week. Maybe we are not in England at all, but somewhere else in the UK? Try Northern Ireland?? I wasn't connected since a week but at first sight,it makes me thinking about Scotland.Scourie or Plockton?